Hi my name is Jark Basnillo i like Browser MMO games because it is so cool you dont have to wait to play the games! I just have few right now But i'll be sure to add More! Ben 10 omniverse is a MMORPG that you can play all you want! battle at the battle arena fight monsters beat bosses to get a ultra dna! is a 100% browser based game with real time combat, original art, and an entire world to explore. Battle monsters and obtain weapons, armor, pets and items. All you need is Flash and your web browser to participate in the fun with players from all over the world. No downloads, no spyware, no spam and no programs to install. After much anticipation, we are happy to introduce character pages to EpicDuel. Players can now show off their most beastly EpicDuel characters and even share them with friends through Facebook. We kept it basic for this release, but look for more improvements to this feature in future updates! To view someone else's character, replace your name in your character page URL with the character name of your choice! Sacred Seasons 2 is a web based game that runs on Flash. Its an updated version of the original that offers improved graphics and a better user interface. Combat takes place in turn based battles, but where Sacred Seasons 2 really shines is in its class feature. There are 23 classes to chose from, and each comes in four seasonal variations. Players are free to cycle between these classes freely, but only start with access to a handful. Progress through the game to unlock new classes, and level each of them individually. With great music and an original art style, SS2 has high production value and several minigames to keep players entertained. zOMG! is a full fledged browser based MMORPG add on to the existing Gaia Online world. While it can best be viewed as an extension of what Gaia already offered, the depth and scope that zOMG! brings with it warrants its own review. For years one of the chief complaints with Gaia Online was the lack of combat and a true sense of growth which couldn’t be achieved with the forum structure. Luckily the folks at Gaia Interactive listened and have been hard at work on zOMG! for several years and the effort really shows. The new MMORPG addition integrates fluidly with current Gaia avatars (your in-game character is displayed as your Gaia avatar) and offers another reason to stick with Gaia Online. DDTank is very similar to Gunbound, but runs right on a browser window. With no need to download or install any files, DDTank is very accessible and casual friendly. Gameplay is easy to learn, but difficult to master. Players must align their shots properly by taking into account angles, elevation, wind velocity, and other factors. There are multiple game modes, and plenty of different weapon types to use in DDTank. 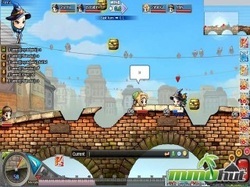 The game also provides players with tasks to complete which give the game direction. DDTank has two game modes: Adventure and Sports. DDTank supports up to 4 players per match. Disney has given Pixar’s Cars the MMO treatment! World of Cars Online is a free to play browser based game based on the CGI film, and it shows. Players start off in the city of Radiator Springs where they’ll meet many of the characters from the movie including Lightning McQueen, Mater, and others. Racing plays a large role in World of Cars Online, but it isn’t the only activity. There is a large virtual world for players to explore that is filled with quests, and even mini games! By racing, completing quests, and playing mini games players earn cash and racing points with which to upgrade their cars appearance and parts. Players can also earn badges and souvenirs. The game is aimed at young children, which may explain the heavy handed chat filtering. Bakugan Dimensions is a 2D browser based Sci-Fi game where players train and battle monsters called Bakugans. The game is aimed at children, but offers simple gameplay that anyone can enjoy. Brawl using three Bakugan at a time against other players or NPC opponents. Neosaurs is a 2D browser based MMORPG where players control dinosaurs and battle against the forces of The Darkness. Neosaurs is a side-scroller with many of the features found in client based MMORPGs. Design your own home and evolve your Neosaur!